In the fifth grade we go to Farm School in February every year. At Farm School on Wednesday night we square danced and on Thursday night we did a Variety show. During the square dancing we did a heel toe and a do si do. The music was done by the farmers, Charlie and one other guy. Charlie was playing the fiddle and the other guy was playing the bass. Everyone was having fun and enjoying themselves. We were dancing and laughing and just having a good time. On Thursday night, the Variety show was a big hit! There were performances of all types and personalities. People told stories, did skits, comedy and there was a big variety of things. For instance, Saadiq and I, told a story. Saadiq told it, and I acted it out. Now it wasn’t a talent show because, you don’t need talent to be in it. At Farm School the farmers showed us how to play some games. One example is we learned Yeeha! You play it by saying Yeeha! and you use one arm. There are 29 different moves but we only learned pitchfork,haybarn,i got a snake in my boot, and down little doggie.We also learned another game called Cows, Cows, Cross My Pasture. You do that by running from end to end and there is an “electric fence” that you can not touch or go past and try not to get caught by the two farmers. If you get tagged you become a plant called a thistle and try to tag people but you can't move. Another game we learned is Camouflage. You have to hide and try not to get seen by the monarch and if you are seen you are out but if you survive the round in the second round they say “migrate!” and the third round they say “everyone in!” and you have to tag the monarch's hand to win the game. Mooooo! 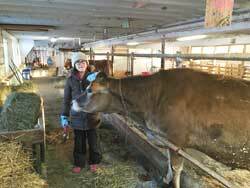 The cow barn at the Farm School in Athol, MA is a wonderful place to go to. If you’re looking for a place to hang out with your friends and some animals, the cow barn is the perfect place to go to. When you’re in the cow barn, you have the opportunity to milk, brush, and care for the cows. You may also be able to feed them fresh hay from the hay loft. All the cows are friendly except for Daisy. I don’t think she would be very a“moo”sed to see you. Do you know about the chicken coop yet? No? Well, we’re here to tell you about it. The chickens are very noisy. When it comes to noisy, the chickens beat almost all of the animals. Be safe and calm around the chickens--they get frightened quite easily. If you are afraid of the chickens, rest assure that they are far more afraid of you than you are of them! Check out the chickens when it’s your turn to go to Farm School. Trust me, you’ll love them. The goats at farm school can seem a little scary or mean. But once you get to know them they are super sweet and fun to be around. I know this from experience. We took them on a walk and they would follow us around. They actually like to be around people. They didn’t mind us at all. I even hugged one. It was pretty awesome. The goats get milked, by the kids! At first it seemed strange, but soon after we started, it was fun! The adult goats are all female and are named, Minerva, Venus, and Juno. The adults are a bit skittish at times, (unlike the baby goats) but overall are awesome animals! The pigs love to play and will push you a little but that does not mean that they hate you. In fact it means quite the opposite, they like you and want to play. They live in a l pen outside the draft barn (the draft barn is where the horses sleep). They sometimes do some pretty funny things, Like stepping in there water and spill it when we come in with food or milk. They are crazy but loveable. You would be surprised with their appearances because when you think of a pig you would imagine them very dirty but these pigs are actually quite clean. So When/if you go the farm school don’t feel afraid of going in the pig pen! The animals there are amazing and nice they are so fun to be around.